This morning's satellite picture (below) shows a frontal system approaching the coast. 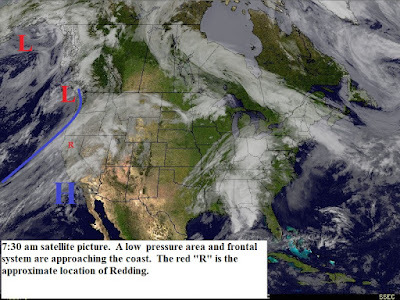 This system will spread rain over Northern California today and tonight with snow levels 6000 feet or higher. The precipitation will turn to showers early Tuesday and then end by midday. Wednesday through early Saturday a weak high pressure ridge will be just off the coast (see map below). During this time the north state will see partly sunny skies with a few clouds...especially over the coastal and areas north of Redding...from storm systems moving by to our north. The models show a low pressure trough moving across Northern California late Saturday and Sunday. They differ on how far south precipitation from this system will occur.